Educators are in the unique position to impart knowledge, open minds and inspire students to make positive changes that can impact the entire world. With this in mind, it is no wonder that Hollywood has turned to educators as a source material for some of the most uplifting and beloved movies of all time. Every teacher has the potential to be as inspiring and profound as those depicted on the big screen. 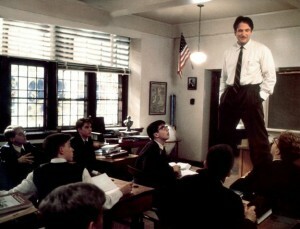 “Dead Poets Society” is an Oscar-winning film from 1989 that featured Robin Williams in the role of educator John Keating. During the course of the movie, Keating seeks to teach his English students about the power of poetry, knowledge, feelings and authenticity. Although it takes a while to get through to them, Keating is able to make a notable impact. At times as tragic as it is uplifting, “Dead Poets Society” is a prime example of the vital role that teachers can play in the lives of their students. Edward James Olmos portrayed real life educator Jaime Escalante in the 1988 film “Stand and Deliver.” Escalante accepts a position teaching calculus at a school with a high dropout rate, and he uses accessible terminology to get his teenage pupils interested in learning. For example, he changes math word problems to include verbiage about boyfriends and girlfriends. This type of outside the box thinking is exactly what captures attention and helps motivate students to stretch beyond their preconceived erroneous limits. “Music of the Heart” is another biopic, which proves that schools around the world are filled with inspiring educators who help bring about real change in their local educational system. Meryl Streep brings Roberta Guaspari’s determination to life for movie audiences, and she also helps highlight the critical role that music education can play in the lives of children. Guaspari taught violin to inner city elementary students in East Harlem. Studies have shown that music programs help children perform better in all aspects of school, and this is consistent with Guaspari’s experience. This made for TV movie gave former “Friends” star Matthew Perry the opportunity to portray real life educator and motivational speaker Ron Clark. Clark’s transition from teaching at a comfortable North Carolina school to working with disadvantaged youths in Harlem is practically guaranteed to inspire any current or future educator. Clark purposefully sought out the most difficult classes and utilized unusual methods to reach his students. In one humorous and compelling scene, he teaches them about history by creating the President Rap. The 1980s were filled with powerful movies about teaching, and “Lean on Me” is another stellar example. Morgan Freeman won an Image Award for his performance as Joe Clark. Although the film dramatized Clark’s real world experiences, it still does a good job of showing the highly unusual tactics that the principal employed to take his school back from gang violence and drug abuse. As a result of Clark’s sometimes almost over-the-top efforts, the school saw an improvement in basic skills testing levels. Gang affiliation also began to fall as students were given the environment they needed to succeed. Educators such as Ron Clark, Roberta Guaspari and Jaime Escalante prove that kids from all walks of life can become engaged in the educational process when their teacher meets them halfway. Whether someone ends up teaching in an affluent suburb or an inner city school, they have the ability and responsibility to inspire their students.